August 25, 2017 at 12:10a.m. Western Reserve finally got the home opener it wanted. For the past two seasons, Columbiana was the spoiler. Now-graduated Clippers quarterback Mitch Davidson would terrorize the Blue Devils defense as they gave up a combined 107 points in two-straight season-opening losses. On Thursday night, Western Reserve held Columbiana to three points as it won, 34-3. 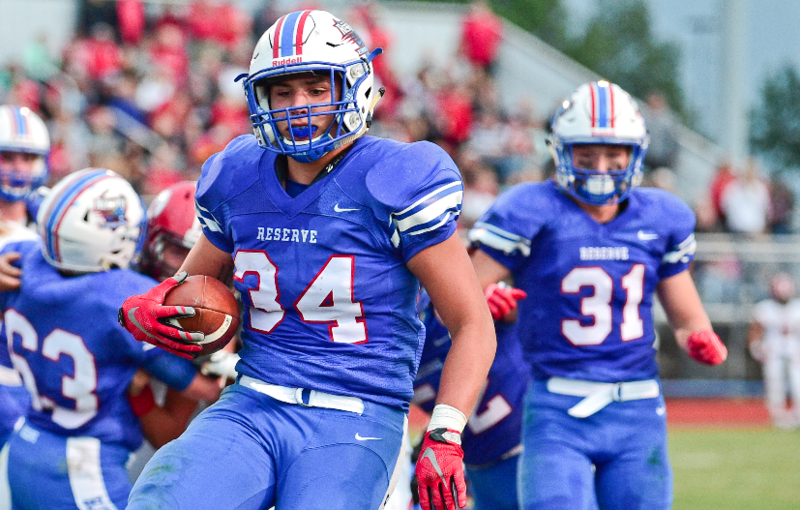 Western Reserve’s first victory against the Clippers since 2014 featured stellar two-way play. Cappabianca, an Ohio State walk-on, rushed for 113 yards on just nine carries while getting two sacks on defense. His backfield mate, Adam Gatrell, ran for 75 yards a touchdown, but his best work may have been on special teams as he blocked two punts. Dom Velasquez also put up a strong performance at QB, going 12-for-20 for 155 yards and two touchdowns. Western Reserve’s offense had no turnovers. As a unit, the Blue Devils’ defense sacked Columbiana’s Jakob Cross three times and held the Clippers to 125 total yards. Coach Andy Hake had his defensive backs cover the Clippers wideouts one-on-one while having everyone else in the front seven tee off on Cross. Cross was the Clippers’ most effective offensive player, getting 32 yards on the ground. By air, he was 6-for-19 for 89 yards. The first two Blue Devils offensive plays resulted in touchdowns. Cappabianca took his first handoff 69 yards for a touchdown. Reserve then forced the Clippers to turn the ball over on downs at their own 40-yardline. On the first play of the subsequent drive, Blue Devils quarterback Dom Velasquez lobbed the ball 40 yards to Kade Hilles to build a two-score lead. Velasquez turned a would-be sack into a TD on the play. Western Reserve’s third TD came as Columbiana fell victim to some retroactive officiating. With about nine minutes left in the first quarter, the Clippers defense forced a three and out and the Blue Devils wisely punted the ball away. As the Clippers ran their first offensive play, officials halted play. They determined that Columbiana had committed a personal foul during the punt and that meant a first down for the Blue Devils. Spaite declined to address the officiating snafu. Three minutes later, Velasquez tossed a 39-yard touchdown pass to Demsky. Columbiana broke the shutout in the final minutes of the first quarter with Jared Bryarly’s 23-yard field goal. Cappabianca punched his second touchdown from two yards out at the end of a six-minute drive in the second quarter. In a drive set up by Gatrell’s second blocked punt in the third quarter, he had a four-yard touchdown run to turn on the running clock. August 27, 2016 12:10 a.m.
September 23, 2017 12:08 a.m.
August 21, 2016 10:27 p.m.